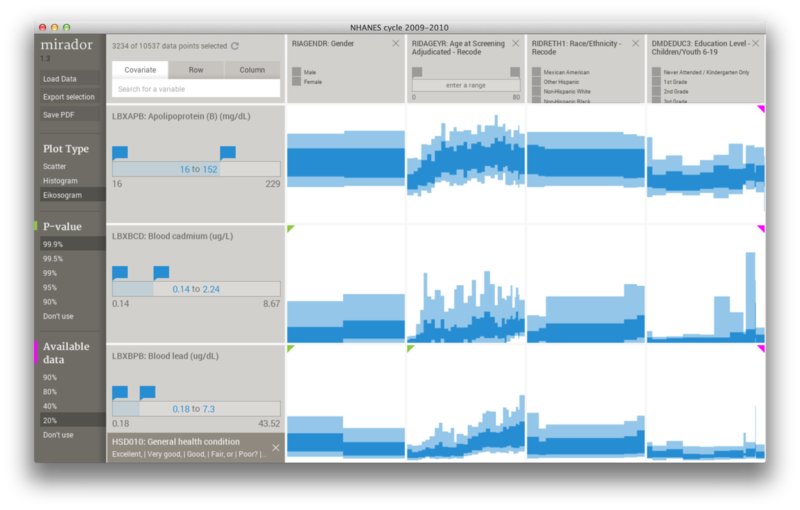 Mirador is a tool for visual exploration of complex datasets. It enables users to discover correlation patterns and derive new hypotheses from the data. Download the appropriate installer or compressed file for your operating system. Once downloaded, run the installer or unzip the file. Open the app and select a dataset in a supported format. Check out the video tutorials to get started. Read the user manual or the wiki for more details. Mirador is an open source project released under the GNU Public License v2. It is the result of a collaboration between the Sabeti Lab at Harvard University, the Broad Institute of MIT and Harvard, and Fathom Information Design. Initial support was provided by the Center of Communicable Disease Dynamics and the MIDAS network funded by the National Institutes of Health. Copyright © 2014-17 Fathom Information Design. All Rights Reserved.